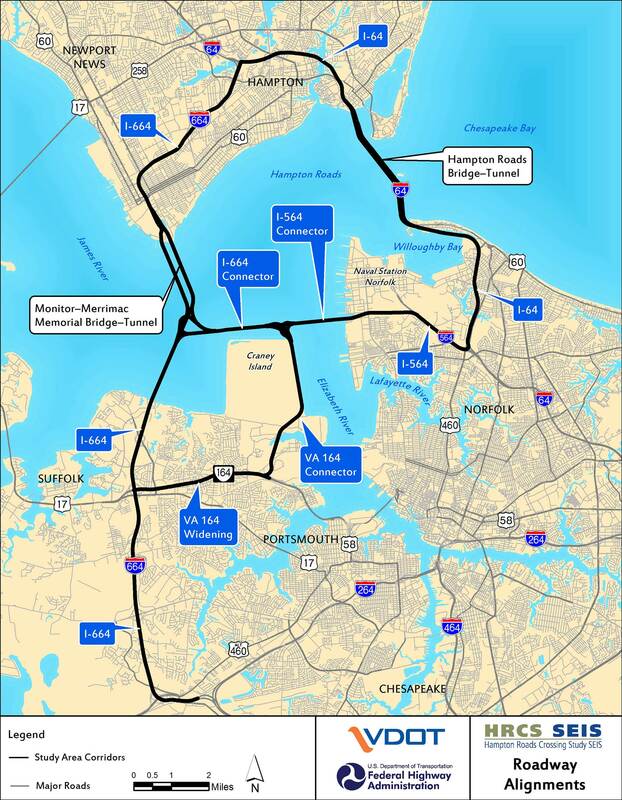 HMMH conducted the air quality and noise analyses for the Hampton Roads Crossing Study Supplemental Environmental Impact Statement (SEIS) in 2015-2016. The large study area included over 30 miles of highway under detailed evaluation. Noise levels were predicted and noise impact was assessed for six alternatives under evaluation at over 6,500 noise-sensitive receptors. Over 25 miles of noise barriers were evaluated for noise abatement at impacted receptors. The Final SEIS for the selected alternative was completed in the first half of 2017, and the FHWA issued a Record of Decision in June 2017. Potential impacts for carbon monoxide were conducted for the freeway and nearby intersections that might be impacted by the project. The tunnel air quality analysis evaluated options for controlling the level of vehicle carbon monoxide emissions to acceptable concentrations within the tunnels during peak hour and emergency conditions, in accordance with FHWA guidance. Finally, a qualitative discussion of greenhouse gas emissions (GHG) was also conducted for the Project.